“OSMIUM GUILLOTINE” is a band full of potential and history, over the past 6 years they have released numerous EP’s and had a few line-up changes leaving James Balcombe the only remaining founding member, that being said though, the Heavy Metal quartet from Essex are now at the strongest they’ve ever been with the release of their self-titled debut album. Recently, however, after this release and the recording of their upcoming live album “Live From The Asylum” (due for release later this week), Dan Thurgood was replaced by Josh Birch. For those who haven’t heard “OSMIUM GUILLOTINE” before, this band is a very broad mix of pretty much every balls to the wall genre out there; Heavy Metal, Punk, Hard Rock, Doom Metal… If you can bang your head and drink beer to it, these guys have it, and pull it off with ease! The album starts off with a minute and a half long intro self-titled to the band and album which was composed by Chris Saunders (“EARTHMASS”, “5 STRING DROP OUT BAND” and many others), this track sets the tone perfectly for this album and easily builds up atmosphere and tension with the dark and atmospheric mix of strings and synth which prepares you for the evil awaits that is OSMIUM GUILLOTINE. “Martyrdom” is a great and evil sounding song which has been very well written by the boys, structured perfectly with a number of rhythm and tempo changes which shapes up a killer track to jump start this album. It has to be said that the production quality on this album is brilliant, every instrument cuts through crystal clear and the guitar tone especially for this release really grabs you by the guts! “D-Day” is a personal favourite of mine; Lots of classic NWOBHM riffs and melodies here in a short 3 and a half minute trash-paced song. It’s one of the re-recorded oldies on this album which I’m very pleased about by the way; OSMIUM GUILLOTINE have resurrected 5 older songs on this album, now usually when bands re-release songs on a new album, I’m not usually a fan of it, but these guys have this justified due to the better production opportunities and because of the changes in the line-up since their original releases on the “SUBHUMAN” and “INTO THE BATTLE” EP’s, and they really back a punch! Not to mention that these are all well-known favourites to their fans so hearing them with better production and the new line-up is awesome! Next on the album is the first taster that fans ever heard from the album, “Phobophobia”, written about the fear of having a fear. This song was released as a single back in late 2013 and is a mammoth of a song, starting out on clean guitars from Lance Steele and a solo which slowly cranks up the tension from Pete Keliris, before blasting out into a thrash metal riff which instantly gets you moving. There are some really cool moments on this song where you’ll find yourself singing along with Pete’s aggressively powerful vocals and playing air guitar along with the 2 minute virtuosic outro! A hell of a great song to see live as well might I add so if you ever get the chance to see these guys then I urge you to take it. “Blight Upon Mankind” takes a slower approach than previously heard on the album which is in no way a bad thing, very heavy from start to finish and I get a strong “BLACK SABBATH” and “MOTORHEAD” vibe with this one and features some great vocals lines to shout back at them live. “City Of Chaos” is another favourite of mine, very fast and powerful and the main riff number is one of my favourite riffs on the album, it gets your heart pumping instantly and it never leaves your head. Just over the half-way mark in this one, the tone is dragged down with some slower clean guitars and chilled out vocals and then a bluesy Tony Iommi like guitar solo which then picks up into the original riff to end all riffs to take the track to a close. “Hobgoblin” is next up, and this one feels a lot like a folk metal track, probably to do with the fact that It’s influenced by Hobgoblin ale. This is one of those songs that will always be a favourite of mine since I heard it on the “SUBHUMN” EP; it’s full of very catchy lead lines at an “IRON MAIDEN” galloped pace that always stick in your head. Dan Thurgood takes the opening spotlight for the next track “Goomba” with a bass line outlining the main guitar riff of the song. The levels and changes used in this song are very well written, with the verses being fairly slow and chilled, which bursts into heavy bridges and a loud and groovy chorus which you will find yourself singing along to when it comes around for the second time. This song even features some slide guitar at the end of the track courtesy of Pete Keliris, which gives the song a whole new original vibe, not many metal acts can pull off slide guitar but Keliris accomplishes this with ease both live and in the studio. “Into The Battle” is another folky song in terms of the main lead line, but the rest of the song is more thrash oriented, definitely one of the fastest on the album and has some awesome guitar and vocal harmonies later on in the track. Next up is their instrumental called, “Breathe it in, Son” and is the second longest song on the album at 6 and a half minutes. This one is a monster of a track, mid-tempo and very heavy and has a lot of cool solo work from the guys including a bass solo from Thurgood at around the 4 minute mark. Usually only progressive bands can pull off a 6 minute instrumental without it getting tedious, but OSMIUM GUILLOTINE pulls this off with no struggle and is always brilliant to see live. The final and longest track “Subhuman” is one of the most epic thrash metal songs of all time, at times the one reminds me of “Overkill” by “MOTORHEAD” due to the consistent speed and the way that after solos seem to bring the song to a close, the main riff kicks back in again better than ever to encore the song and the album. This one even features solo drum work from James Balcombe which is great to hear, this guy is known for being absolutely mental so its great hearing him smack the crap out of his drums to a blinding speed and then bring the tempo down until it almost sounds a little like “SLAYER” for a short while. Not enough can be said about how much of a success this album is and I strongly recommend you pick it up and see them live. 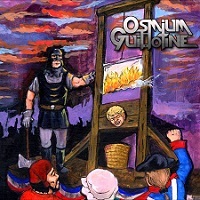 “OSMIUM GUILLOTINE” are definitely not a band you should let slide by.